Global precision engineering and manufacturing technologies company, Renishaw, announced that it will be showcasing its factory of the future technologies and intelligent process control solutions at the China International Machine Tool Show (CIMT) in Beijing, which is scheduled to take place from 15th-20th April 2019, at stand W3-A251 in the UK Pavilion of the New China International Exhibition Center. Visitors to Renishaw’s stand – themed, ‘Benefit from the factory of the future, today’ – will be able to discover the benefits of Industry 4.0 in action such as process automation, data-driven technologies and process control through actionable feedback. There will be a demonstration cell of an aerospace blade being manufactured through several stages, across both traditional CNC machining and metal additive manufacturing (AM) – also known as ‘3D printing’. 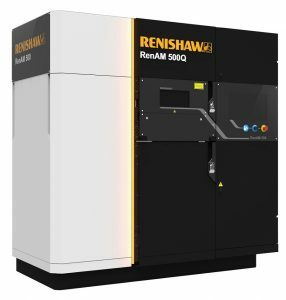 To showcase Renishaw’s AM expertise, the aerospace blade will be built on Renishaw’s RenAM 500Q additive manufacturing system, featuring four high-power 500 W lasers, each able to access the whole powder bed surface simultaneously. It achieves significantly higher build rates, vastly improving productivity and lowering cost per part. The RenAM 500Q features automated powder and waste handling systems that enable consistent process quality, reduce operator intervention time and ensure high standards of system safety. Above: Renishaw Plc.’s RenAM 500Q/Image Source: Renishaw Plc. Progressing through the demonstration cell, there will then be a focus on machine calibration and optimisation through a demonstration of Renishaw’s new XK10 alignment laser, to enable a known and repeatable level of process capability. Then a robot will move the part to Renishaw’s Equator™ gauging system, which enables intelligent process control by delivering highly repeatable, thermally insensitive, versatile and reprogrammable shop-floor gauging. Due to the introduction of intelligent process control software, manufacturers can automate process control and tool offset correction directly to CNC machines from any Equator gauge. Finally, in terms of post-process control, the part will be inspected on a co-ordinate measuring machine (CMM) where Renishaw’s REVO® 5-axis measurement system offers a multi-sensor platform to provide high-speed tactile scanning and non-contact vision measurement. Renishaw’s SFP2 surface finish probe will also be demonstrated, which increases the surface finish measurement ability of the REVO system, combining surface finish measurement and dimensional inspection into a single platform to give unrivalled advantages in time, part handling and return on investment. About Manufactur3D Magazine: Manufactur3D is an online magazine on 3D Printing. Visit our Global News page for more updates on 3D Printing Technology News. To stay up-to-date about the latest happenings in the 3D printing world, like us on Facebook or follow us on LinkedIn.